Chance is that you are using the calculator that is provided with the operating system if you work with a software calculator. While these are usually fine for basic calculations they do lack the depth and functionality of professional calculators. One option is to download and use a more versatile calculator. 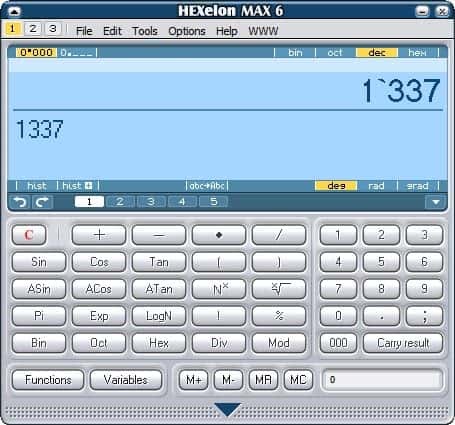 The Hexelon Max Calculator is such an alternative for the Windows operating system that does not only provide the functionality of a mathematical calculator but also that of a currency converter and units converter. The calculator can be downloaded as a portable version or installer for most Windows operating systems including Windows XP and Windows Vista with the likelihood that it will also work fine in Windows 7. The calculator presents itself in a very compact interface. This can be a bit problematic for new users who are looking for a specific feature or function. Some buttons change parts of the interface completely. Pressing the buttons 1-5 that are displayed in the middle of the calculator will for instance change the operations and functions in the lower left half completely. One interesting option is the ability to add, move or remove new operations and functions from that part of the calculator. That's excellent for users who regularly work with a specific set of operators and functions to access them directly without having to change the interface. It is furthermore possible to add new functions and operators that can then be added to the interface. The unit and currency converter are accessible from the top menu. Everything can also be accessed by using keyboard shortcuts. Hexelon Max Calculator is a well thought out calculator that's perfect for users who want to customize the calculators interface to suite their specific needs. I prefer PowerToy Calc from Microsoft. No buttons mess, just type expression.